When it comes to Batman movies, it's hard to beat Christopher Nolan's Dark Knight trilogy. For a lot of DC fans, it was hard to see someone other than Christian Bale in the role and wanted him to continue when Batman v Superman: Dawn of Justice was announced. As it turns out, Kevin Smith is one of those fans. He recently admitted that he would have preferred to have Bale in the film instead of his old friend Ben Affleck, who has seen his fair share of criticism in the role. In the latest episode of his Fat Man on Batman podcast, Kevin Smith explained the reasoning behind his choice, and no, he's not knocking Ben Affleck's portrayal of the Caped Crusader in Batman v Superman. Smith is a major fan of the Dark Knight trilogy and his main point is that he would've liked the continuity of having Christian Bale in the role. An audience member asked Smith if the DCEU would be in better shape had Bale stayed on. Smith had this to say. "It feels like, I mean, was that, they weren't saying that Ben was Christian Bale, but they were saying like oh he's been around for years he's not that guy anymore. I think I would have preferred it, and I'm not, this ain't sh*tting on Affleck, but as a guy who loved the Nolan trilogy when they announced like hey they're making Man of Steel and Chris Nolan's a producer on it, I was like "oh f*ck man, so that means like his Batman and his Superman will coexist and then ultimately it wound up being Zack Snyder's Superman... Batman instead." 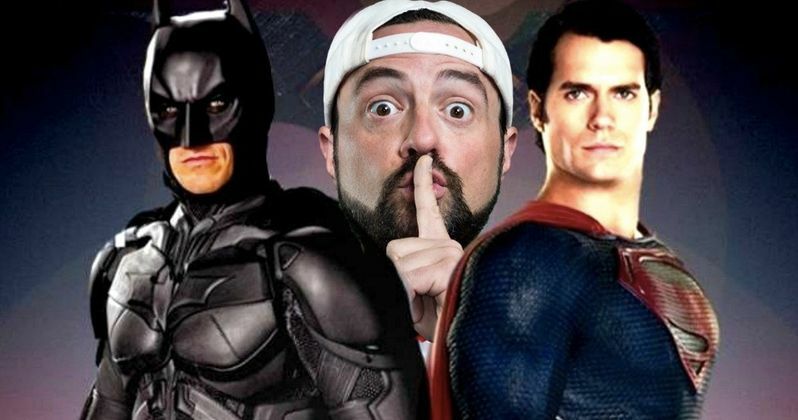 Kevin Smith went on to talk about what the DCEU is doing now and how it compares to the Marvel Cinematic Universe, which is a big sticking point amongst DC fans. Marvel has undoubtedly made an incredible interconnected universe over the last 10 years, but DC had the head start, which Smith points out. And again, for Smith, it comes down to the continuity of Christian Bale in the Batman role. He explains. "I would have preferred the Christian Bale version just as a continuity freak of like yeah, all these f*ckers... and also it would have been like, what does everyone b*tch about DC movies doing? Oh, they're trying to be like Marvel and catch up to Marvel. They had it right there. They were like making these f*cking Batman movies forever so now we're just going to connect them, so we've got a universe but instead they launched a brand-new universe." Kevin Smith and co-host Mark Bernardin then discussed how easy it would have been to link The Dark Knight Rises to Man of Steel. Both Bernardin and Smith make valid points, but it seems unlikely that Christian Bale would have returned to the role in the first place. However, he could have made a cameo to help bridge the gap in the DCEU. Bernardin says. "And not only that, but then it becomes an emotional story, it becomes what makes this guy give up happiness like what does Superman do... we won't discuss the fact that Batman retired because Batman doesn't f*cking retire, but had he retired, what's enough to pull this guy away from the dream he's always had of having the girl, of having the paradise, of having to be able to not be haunted and tortured by his parents' death what brings the guy to put the suit back on?" When asked last year if he would return to a superhero movie, Christian Bale said that he wasn't interested. The actor even admitted that he has never seen any other superhero films except for the Dark Knight trilogy and the original Superman franchise with Christopher Reeve. As for Ben Affleck's return to portray the Caped Crusader, that is unknown at this time, but it doesn't look good. You can listen to the Fat Man on Batman podcast at Smodcast.